(2011) "Dancin' Away with My Heart"
"Dancin' Away with My Heart" is a song recorded by American country music trio Lady Antebellum. It was released in December 2011 as the third single from their album Own the Night. The song was written by Hillary Scott, Charles Kelley, Dave Haywood and Josh Kear. It became a top 5 hit. Billy Dukes of Taste of Country gave the song three and a half stars out of five, saying that it "aims right down the country-pop middle but leaves one wanting for a little more depth." Kevin John Coyne of Country Universe gave the song a D, writing that "it isn't bad enough to be offensive" and "it doesn't exist enough to be bad." The music video was directed by Adam Boatman and premiered in February 2012. This was the back up video after the high-budget original video was shot in December, which was never released. "Dancin' Away with My Heart" debuted at number 57 on the U.S. Billboard Hot Country Songs chart for the week of December 24, 2011. It soon peaked at number 2, behind "Drink on It" by Blake Shelton and "Banjo" by Rascal Flatts. ↑ Conaway, Alanna (January 8, 2012). "Lady Antebellum, 'Dancin' Away With My Heart' – Lyrics Uncovered". Taste of Country. Retrieved January 23, 2012. ↑ Dukes, Billy (December 8, 2011). "Lady Antebellum, 'Dancin' Away With My Heart' – Song Review". Taste of Country. Retrieved January 23, 2012. ↑ Coyne, Kevin John (January 18, 2012). 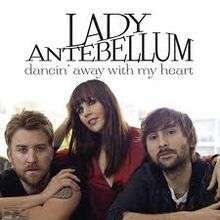 "Single Review: Lady Antebellum, "Dancin' Away With My Heart"". Country Universe. Retrieved January 23, 2012. ↑ "CMT : Videos : Lady Antebellum : Dancin' Away With My Heart". Country Music Television. Retrieved February 28, 2012. ↑ Morris, Edward (December 17, 2011). "Scotty McCreery's Clear as Day Recaptures Album Peak". Country Music Television. Retrieved January 23, 2012. ↑ "BDSRadio Charts (Canada AC National Airplay)". BDS Radio. Nielsen N.V. Archived from the original on 21 March 2012. Retrieved 7 February 2015. ↑ "BDSRadio Charts (Canada Country National Airplay)". BDS Radio. Nielsen N.V. Archived from the original on 21 March 2012. Retrieved 7 February 2015. ↑ "Best of 2012: Country Songs". Billboard. Prometheus Global Media. 2012. Retrieved December 14, 2012.